Swiss psychoanalyst Alice Miller's writings have changed the way many people view themselves and their world. In simple but powerful prose, the deeply moving "The Drama of Being a Child" showed how parents unconsciously form and deform the emotional lives of their children. 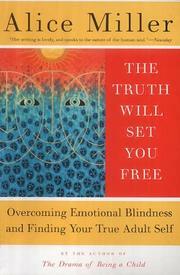 In "The Truth Will Set You Free" Miller returns to the intensely personal tone and themes of her ground-breaking work. She says, "I simply refuse to see obedience as a virtue, curiosity as a sin, and ignorance of good and evil as an ideal state". Only by embracing the truth of our past histories can any of us hope to be free of pain in the present, she argues. Miller's vivid true stories reveal the perils of early-childhood mistreatment and the dangers of mindless obedience to parental will. Drawing on the latest research on brain development, she shows how spanking and humiliation produce dangerous levels of denial. This denial, necessary for the child's survival, leads to emotional blindness and finally to mental barriers that cut off awareness and the ability to learn new ways of acting. If this cycle repeats itself, the grown child will perpetrate the same abuse on later generations, warns Miller. "The Truth Will Set You Free" should provoke and inform all readers who want to know Alice Miller's latest thinking on this important subject.